The acronym MUŻA stands for Mużew Nazzjonali tal-Arti (Maltese for National Museum of Fine Arts), but also refers to the Muses, the mythological figures inspiring the arts and the etymological source of the word museum. Designs for MUŻA, the Valletta 2018 flagship project, have been announced and will be on display during Notte Bianca. The designs are the winning project for MUŻA – the new National Museum of Art at Auberge d’Italie, chosen from amongst 18 submissions presented by Maltese, international and multinational consortia. This project, together with all the other submissions presented, will be on exhibition at Auberge d’Italie from the 4th to the 21st October. The chosen project was presented by a multinational team; DTR, CYAN Engineering and Martello Media. DTR is a Maltese multi-disciplinary firm with particular expertise in architectural design for local context and historic contexts, civil and structural engineering and interior design. Cyan Engineering is a Maltese company specialised in merging contemporary building designs within historic contexts and Martello Media is an Irish multi-disciplinary team specialising in exhibition design and interpretative planning. The team also includes additional Maltese expertise who will be working in tandem with Heritage Malta’s recognised specialists on this new museum typology, purposely developed for Malta. 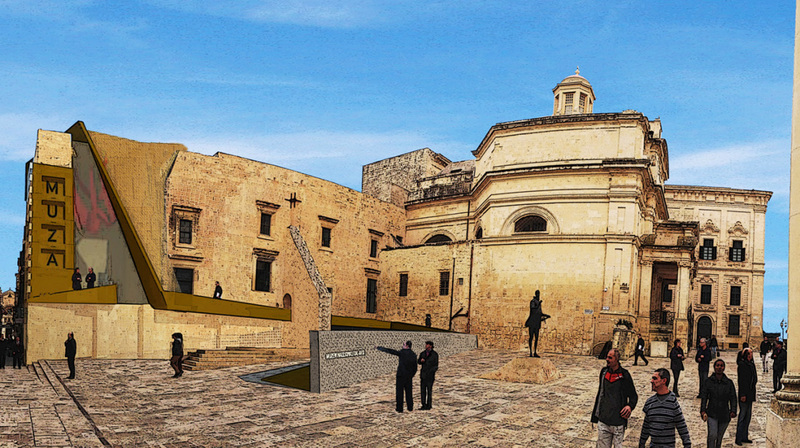 The project will lead to the development of a new national institution for the visual arts in Malta (EU). The acronym MUŻA stands for Mużew Nazzjonali tal-Arti (Maltese for National Museum of Fine Arts), but also refers to the Muses, the mythological figures inspiring the arts and the etymological source of the word museum. MUŻA is also the Maltese word for inspiration.